“Technology means we can now see what was previously hidden,” said Professor Brian Francis, of Lancaster University in England. Francis is using 4-D ultrasound scans to see what happens on the faces of unborn children in response to an expectant mother’s cigarette smoking habit. Francis and his research team from Lancaster and Durham Universities have discovered facial differences in fetuses from smoking and non-smoking mothers remarkable enough to visually document the harm of smoking while pregnant. A 4-D ultrasound scan adds the dimension of time to the more typical 3-D ultrasound scan so often used during pregnancy. 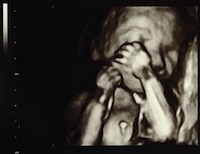 The technology produces an extended live-action video glimpse of life inside the womb. The Lancaster study involved 20 pregnant women, four of whom smoked an average of 14 cigarettes a day; the other women did not smoke. Each woman allowed a 4-D ultrasound to be taken of her unborn child four times between weeks 34 and 36 of gestation, giving the research team 80 scans to assess. The 4-D scans revealed more mouth movements in the fetuses of the smokers than those of non-smokers. The fetuses exposed to cigarette smoking in the womb also their hands to touch their own face and head more often. The Francis study confirms the findings of previous studies that indicate a fetus will touch itself more often in response to maternal stress or depression. The Lancaster-Durham study indicates this self-touching is more frequent when the mother is a smoker. The research suggests the fetal central nervous system does not develop at the same rate between children of smokers and non-smokers. The research team would like to see a larger study that confirms their findings and advances scientific understanding of “the relationship between maternal smoking, stress, depression, and fetal development.” The researchers would also like to see studies that assess the fetal impact of fathers who smoke. All 20 babies involved in the Lancaster-Durham study were born healthy at full term. "High-definition scans suggest effects of smoking may be seen in unborn babies." Lancaster University. Lancaster University, 23 Mar. 2015. Web. 24 Mar. 2015. Reissland, Nadja, Brian Francis, James Mason, and Karen Lincoln. "Do Facial Expressions Develop before Birth?" Academia.edu. Academia, Aug. 2011. PLoS ONE. Web. 24 Mar. 2015.